You'll discover new places. Sure, you might be a long-time local to Vancouver. Perhaps you were born and raised here, too. But what you might not be realizing is all of the places, restaurants, cafes, and shopping that you have been missing out on! Having a bike means that you can meander down side-streets, over bridges, and all over the place, discovering new areas you never would have thought to go with a vehicle or on foot. You'll have the opportunity to visit your favourite areas more frequently. 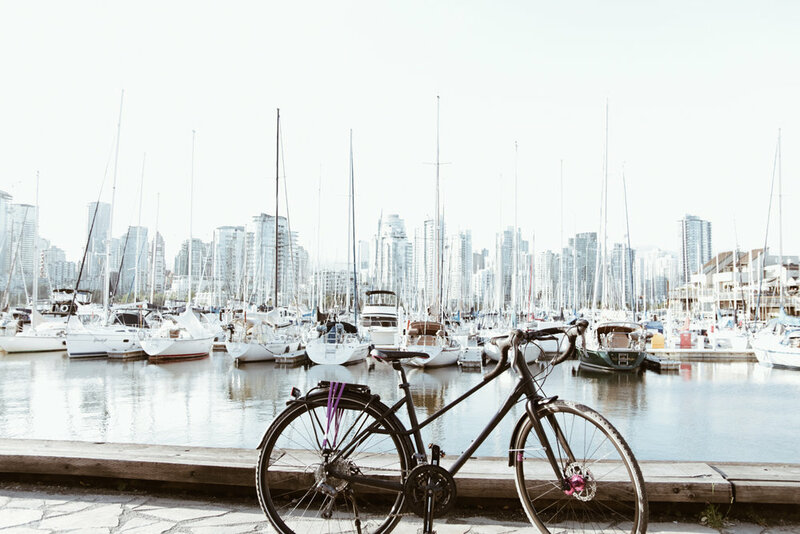 Not being an owner of my own personal vehicle, I find reaching particular areas of the city that I LOVE – like the West End, Kitsilano, or Granville Island – a bit of a hassle. I used to be very guilty of staying within the easy-to-access areas of downtown, but now with my bike, those days are long over! I can reach all of the areas within about minutes on bike – so why wouldn't I? The Seawall and all of the bike lanes! Vancouver is actually surprisingly equipped for cyclists, and in addition to our incredibly bikeable seawall, the city has bike lanes that you may not have noticed in even the busiest of areas – like East Pender, for example. I've been referencing this map which gives you all the best cycling routes of Vancouver. It's the best exercise. Exercising on the regular can be a difficult task to maintain, particularly during those times that get extremely busy. I used to be really good at going to the gym every morning, but for the last six months or so, those efforts have waned quite a lot more than I'd like to admit. Now that I bike to work, however, I can rely on at least 25 minutes of daily exercise without having to put in the extra effort of getting to the gym each morning. Bonus: biking works the areas most of us ladies are most concerned – glutes and legs! It's the easiest way to "go green." If you're a millennial and you're paying attention to some of the latest documentaries, then I'd be surprised if you haven't given climate change a serious thought. The health of the planet is something I now think about almost daily, and it's actually a factor for me when I'm deciding on my modes of transportation. With a bike by my side, I'm now happy to say I'm much greener and I have less of a bad conscience about how my decisions might be affecting our beautiful planet and the generations to come. So I've sold you on biking, yay! I promise you won't be disappointed in the incredible shift owning a bike will make in your lifestyle – from the motivation to get out more to the natural side-effect of getting more regular exercise. Find the right fit. By "fit" I don't just mean a bike that suits what you're after aesthetically. You actually need a bike that will fit your height, because if you end up with a bike that is too big or too small, it might be miserable to ride. A good salesperson like those at Liv Cycling can ensure you get fit properly. Tests lots of models. Before I got my bike, I assumed that I would want a cruiser-style bike with a basket up front. But after sitting on different models, I actually decided that a sportier road bike with the proper drop handles were more my style. I felt assured that this model would be a more capable commuter for near-everyday riding. This is the model I ended up choosing, and I'm more than happy with it! Budget for more than just the bike. In addition to the bike alone, you'll also want to get yourself fully equipped with accessories – like a bike rack or bag, kickstand, helmet, and maybe even a place to put your water bottle. In Vancouver especially, you'll need to make sure you also have a really good lock (or two!) before you take to the streets. Bike theft is just too common here to risk it – bike thieves will steal the tires if you just lock up the frame, which is why I recommend two locks.